Games of this nature – where both sides set out with a low block and look to break – are invariably pretty dull affairs. This one was no different, particularly before the deadlock was broken. The first half sported a mere three shots on target – two from Swansea and one from the visitors. Both of Swansea’s efforts originated from their left hand side, where Jefferson Montero was making mincemeat out of Arsenal’s Calum Chambers. Montero completed six dribbles over the course of the game, four of which were at the Arsenal right back’s expense. Chambers committed three fouls and was lucky not to concede a penalty – a clear push on Bony in the area was allowed to go unpenalised by referee Phil Dowd. Chambers was burned on the outside by Montero for Swansea’s winner in the 78th minute – an inevitable conclusion to a nightmare outing. 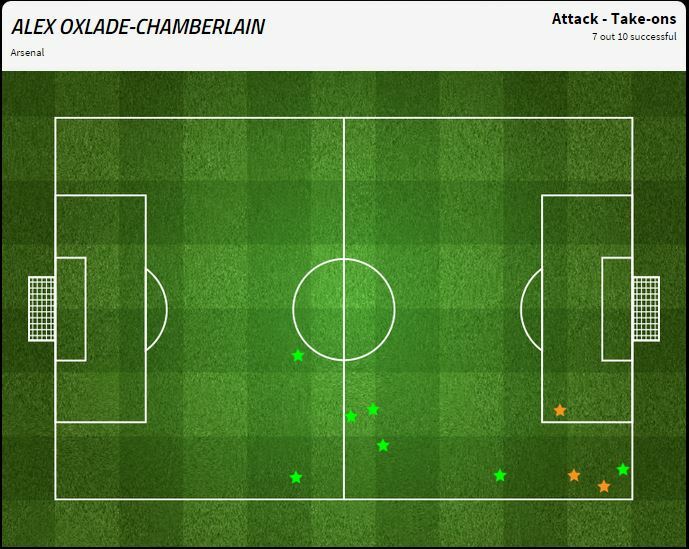 Alex Oxlade-Chamberlain was an equally effective counter-attacking outlet for Arsenal on the same side of the field. He completed one more dribble than Montero, with seven. It was one of those very dribbles that led to Arsenal’s opener – the Arsenal wideman bombing through the middle on the counter to create the opportunity. 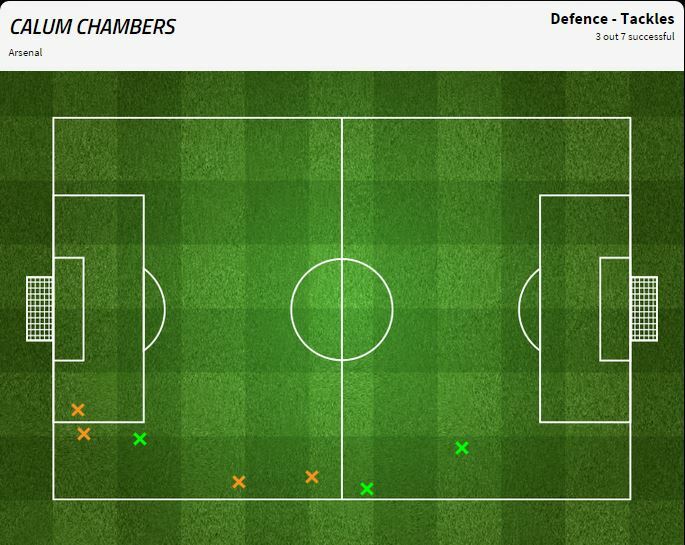 Chamberlain created more chances than any other player this evening, with four key passes completed. Arsene Wenger is not a manager that’s renowned for his ability (or willingness) to react to in-game situations. It was, then, a surprise to see him dispense with his starting 4-4-2 formation after twenty minutes, in order to counter Swansea’s midfield dominance. Santi Cazorla was brought in off the left, with Danny Welbeck and Alexis Sanchez sharing that wide berth over the remainder of the game. This nearly had an undesired side-effect for Arsenal mere seconds after the switch – when Angel Rangel ran off Welbeck to connect with Neil Taylor’s cross for one of those three first-half shots on target. Bafetimbi Gomis’ winner was the sixth headed goal that Arsenal have conceded this season. Only Burnley, with eight, have conceded more. Gomis was up against a defence that featured full back Nacho Monreal at centre back, a defence that started the season with six recognised senior squad numbers. Wenger’s persistent refusal to adequately strengthen his side in that area is becoming more and more indefensible.